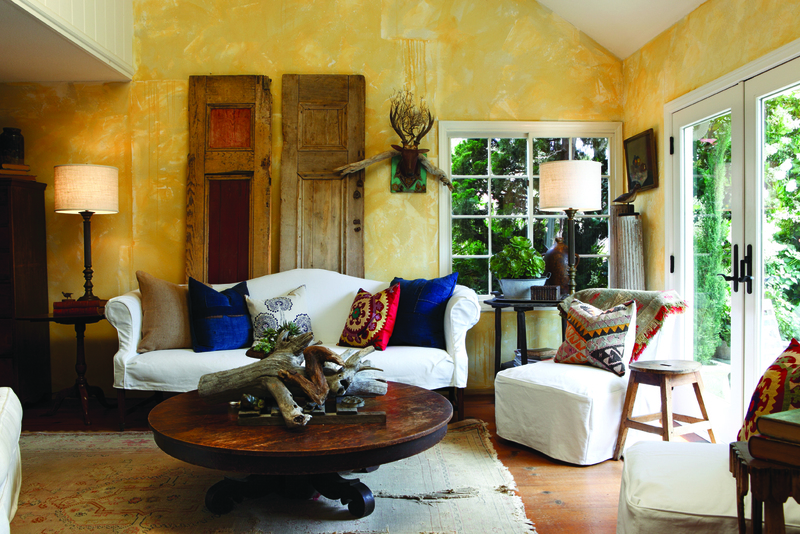 Susan Ellison’s home, tastefully decorated with flea market finds, shares the easy, laid-back charm she developed as a child amidst the natural beauty and graceful ways of the Deep South. One of her decorating favorites is old painted cupboards, also called tall sideboards, or hutches. “The focal point in households of the past, cupboards are interesting to me,” she says. Susan has three large antique cupboards in her bedroom and others throughout her home. “They hold so many different things, from clothes to food,” she says. Architectural and found objects add interest, too. “Some of my favorite things would be of no value to someone else, but I love old paint, old weathered wood and old metal,” she says. While she utilizes timeworn pieces to great effect, Susan’s eye for displaying her items and arranging furnishings keeps her home from feeling like a museum. One way she achieves this is by updating favorite furnishings. “I keep reinventing some of the older pieces that I have had for years,” Susan says. Fresh slipcovers update a Chippendale sofa. New paint on old chairs make them pop. She gives favorite lamps a new lease on life by replacing the style of their shades. “I just changed the shades in the living room from linen to a light-colored burlap that gives them a more updated look,” she says. “Changing rugs, or adding a new rug, can freshen an outdated room, too.” Rearranging furniture regularly keeps the look fresh. “It’s recreation to me. Finding a new spot for an old piece can be like getting something new,” Susan says. This entry was posted in Decor Inspiration and tagged Collectibles, Collections, DÃ©cor Ideas, design, Displays, DIY, flea decor, Flea Market DÃ©cor, style, vintage by Flea Market Decor. Bookmark the permalink.